Associated Press Notre Dame's D.J. Harvey goes up for a shot with pressure from Syracuse's Oshae Brissett, Paschal Chukwu, center, and Tyus Battle on Saturday. 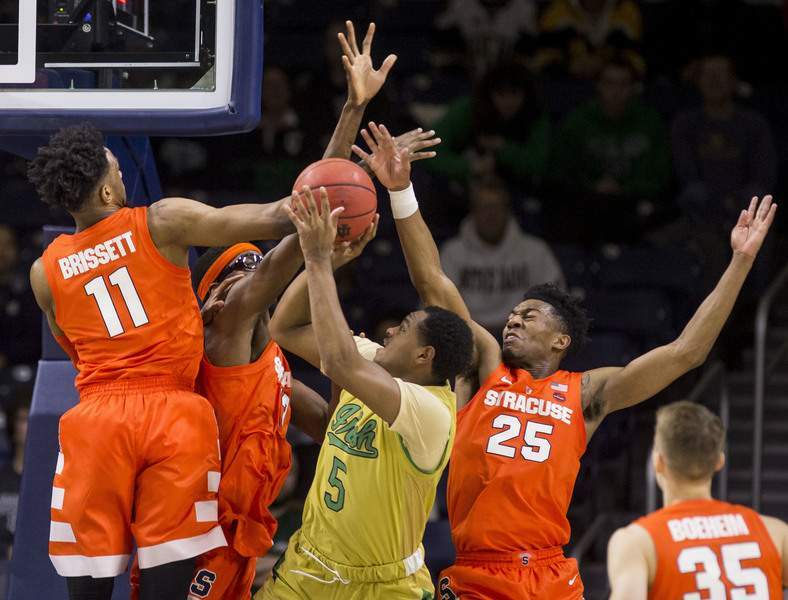 SOUTH BEND – Getting potent production across the board from his Big Three of Elijah Hughes, Oshae Brissett and Tyus Battle – like he got Saturday – is going to prove a necessity more than a luxury this season, according to Syracuse coach Jim Boeheim. Hughes, who has scored at least 15 points in each of his last seven outings, drained 6 of 13 3-point shots. His previous high for made 3s was four. T.J. Gibbs netted 18 points, dished five assists and sank a career-best six 3-pointers in 13 tries for the Irish (10-5, 0-2). Notre Dame, though, virtually disappeared with game on the line. The Irish made just one of their final 11 shots. “I thought the difference again, a little bit like (Tuesday's 81-66 loss at Virginia Tech), was veteran players – men on the other team – made kind of men plays, and we were a little young in some spots trying to figure it out,” Notre Dame coach Mike Brey said. Down 60-58, the Irish had a chance to tie the game with 5:59 remaining, but freshman Nate Laszewski missed the front end of a one-and-one. Hughes answered with a left-wing 3-pointer to start Syracuse's 10-1 spurt. Pflueger, Notre Dame's only scholarship senior, suffered a torn anterior cruciate ligament in mid-December.